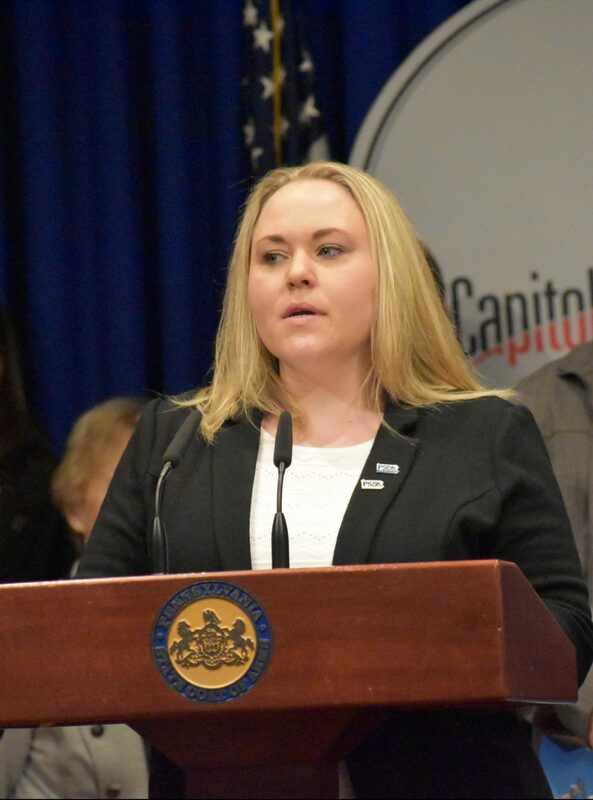 Bridgette May, a certified school nurse in the Erie City School District, speaks during a news conference at the state Capitol on March 26, 2019. "Becoming a school nurse was like a dream come true for my family and I," she said. "However, the salary made it more like a nightmare when it came to making ends meet and supporting my family." Bridgette May worked as a critical care nurse in a hospital for three years. But the night and weekend shifts took a toll. She felt like a zombie during the day. May, a single parent, decided to switch to a job that would allow her to spend more time with her kids. She became a certified school nurse — a move that required her to complete coursework and take on more student loans. And after five years as a school nurse, she still struggles to pay the bills. Her salary in the Erie City School District is under $45,000 a year. She was one of about 40 educators who traveled to the state Capitol on Tuesday to push for an increase in minimum salaries for educators across the state. To make ends meet, May works at after-school programs and picks up some hospital shifts. She said she loves the job and feels like she makes a difference. But she said the salary is “like a nightmare.” She’s thought about leaving and becoming a nurse practitioner — a job that typically pays more than $100,000 a year. From left to right, educators: Bridgette May, a certified school nurse in the Erie City School District; Stacie Baur, a fifth-grade teacher in the Clairton City School District; and Frederick Herling, a physical education and health teacher in the Panther Valley School District. All three have a salary under $45,000 a year. 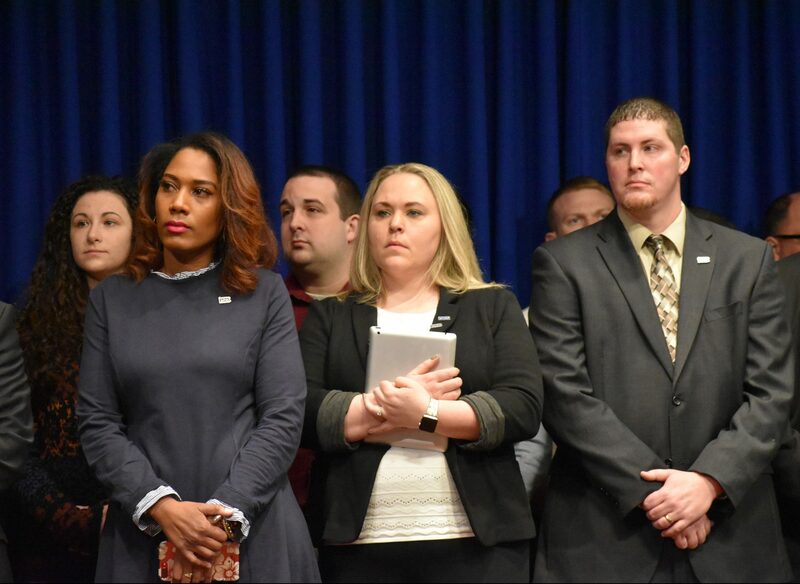 They spoke at a news conference at the state Capitol in Harrisburg on March 26, 2019. Tuesday’s push comes nearly two months after Gov. Tom Wolf proposed the idea of a $45,000 minimum salary for classroom teachers and certain other educators at Pennsylvania school districts, intermediate units, and career and technical centers. Last year, the average Pennsylvania classroom teacher earned a salary above $67,000. But salaries vary widely across the state. The Wolf administration estimates that the increase would cost nearly $14 million next year, and he is proposing state funding for that. Multiple Republican lawmakers have warned that the proposal would have ripple effects and would lead to higher wages for other educators. Those ripple effects would not be covered by the Wolf administration proposal. State Rep. Tarah Toohil, a Republican from Luzerne County, supports the plan. She and Rep. Kyle Mullins, D-Lackawanna, are seeking co-sponsors on a $45,000 minimum salary bill. Several Luzerne County districts would benefit. The most money in the county, about $179,000, would go to Hazleton Area School District, followed by Dallas School District with about $123,000. State Sen. Judy Schwank, a Democrat from Berks County, also spoke in support of the plan Tuesday. In her county, the Reading School District would receive the most money: about $263,000. At Tuesday’s news conference, Toohil and Schwank disputed the idea that a ripple effect would create problems for school districts. Schwank said they looked into whether there was a ripple effect after a change in the law in 1989 that set a minimum salary of $18,500 per year. For the four years before the law went into effect, the average teacher salary grew 3.1 percent per year, Schwank said. But for the four years after the law went into effect, the average teacher salary grew at a rate of about 2.8 percent per year. “It doesn’t necessarily follow that everything is going, in terms of salaries, is going to ratchet up, because of this modest proposal,” Schwank said. 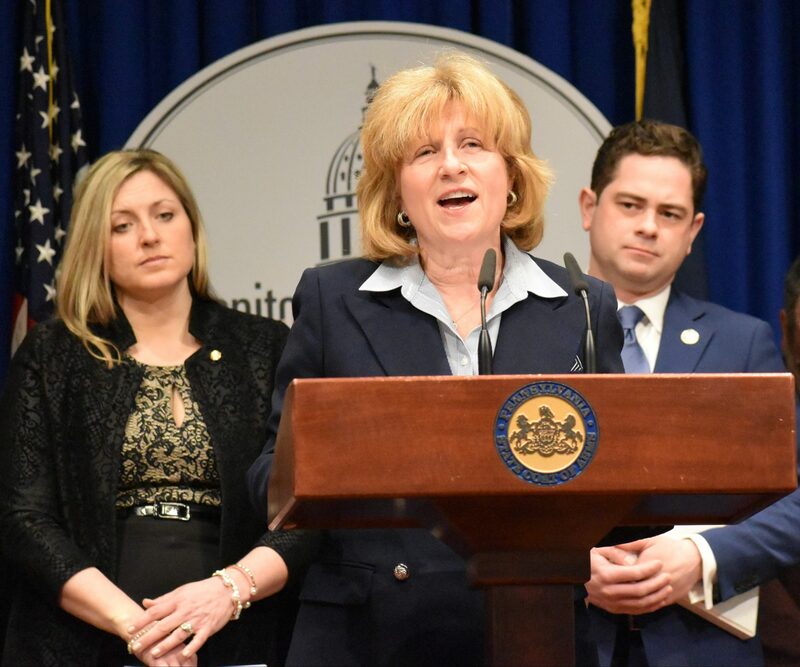 State Sen. Judy Schwank, D-Berks County, speaks during a news conference on March 26, 2019, in support of raising the minimum salary for teachers to $45,000 a year. Wolf’s proposal would cover about 3,200 educators, according to the Pennsylvania Department of Education. It would raise salaries for classroom teachers and other professional staff members, such as school nurses, library specialists and counselors. Charter school teachers are not included in Wolf’s proposal. Many of the districts that would benefit are in northeastern, central and southwestern Pennsylvania. Stacie Baur is a fifth-grade teacher in a southwestern Pennsylvania district. During Tuesday’s new’s conference, she described several financial challenges. She owes about $130,000 in student loan debt. She pays about $700 a month toward those loans. After seven years in Clairton City School District in Allegheny County, she earns about $43,000 a year. She wakes up at about 4 a.m. during the week for an online job, teaching English to students in China. Then she gets dressed and heads to her Clairton job. On weekends, she teaches students online, too. Baur and her husband have thought about buying a house and having children someday. 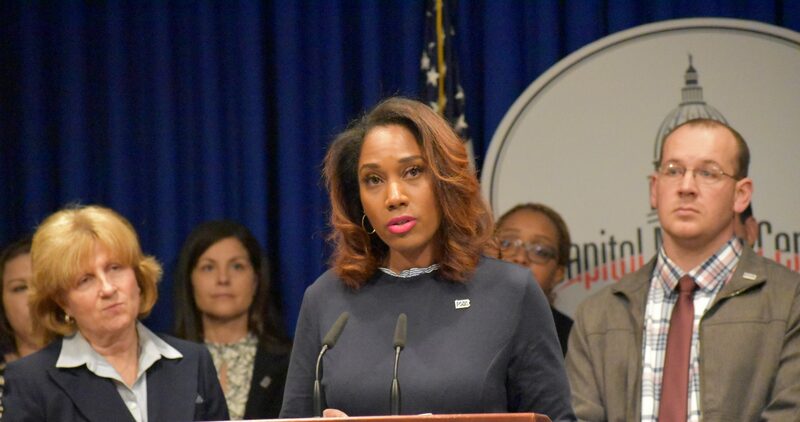 Stacie Baur, a teacher in the Clairton City School District, speaks during a news conference on March 26, 2019.